A hamartoma is a benign tumor that may occur in the lungs, heart, skin, brain, breast, or other regions. They are made up of abnormal but not cancerous cells similar to the cells that make up the tissue where they originate. Hamartomas can look similar to cancer on imaging studies, and for this reason, can be very frightening. In some regions of the body, they may not cause any symptoms, or even regress in time, whereas in others, can cause complications. They may also occur as part of syndromes that predispose people to cancer in a number of different organs. Often times, there are no symptoms associated with a hamartoma and they are found incidentally when a test is ordered for another reason, but when they cause symptoms, it is often related to the location where they occur. A hamartoma is a benign (non-cancerous) tumor that is made up of “normal” tissues that are found in the region in which they grow. For example, a lung (pulmonary) hamartoma is a growth of non-cancerous tissues including fat, connective tissue, and cartilage that is found in the regions of the lungs. The difference between hamartomas and normal tissue is that hamartomas grow in a disorganized mass. Most hamartomas grow slowly, at a rate similar to normal tissues. They are more common in men than in women. While some are hereditary, nobody knows for certain what causes many of these growths to occur. Many people have never heard of hamartomas but they are fairly common tumors. Lung hamartomas are the most common type of benign lung tumor, and benign lung tumors are fairly common. Breast hamartomas are responsible for roughly 5 percent of benign breast masses. Hamartomas may not cause any symptoms, or they may cause discomfort due to pressure on nearby organs and tissues. These symptoms will vary depending upon the location of the hamartoma. One of the most common "symptoms" is fear, as these tumors can look very much like cancer when found, especially on imaging tests. Lungs: Pulmonary (lung) hamartomas are the most common type of benign lung tumor. They are usually found accidentally when a chest x-ray or chest CT scan is done for some other reason. If they occur near an airway, they may cause an obstruction resulting in pneumonia and bronchiectasis. Skin: Hamartomas may occur anywhere on the skin, but are especially common on the face, lips, and neck. Heart: As the most common heart tumor in children, hamartomas can cause symptoms of heart failure. Hypothalamus: Since the hypothalamus is in an enclosed space in the brain, symptoms due to pressure on nearby structures are fairly common. Some of these include seizures, personality changes, and early onset of puberty in children. Kidneys: Hamartomas may be found incidentally on imaging studies of the kidney, but can occasionally cause symptoms of kidney dysfunction. Spleen: Hamartomas in the spleen may cause abdominal pain. Breast: Hamartomas are one cause of benign breast lumps. As noted above, lung (pulmonary) hamartomas are the most common benign tumors found in the lungs and are often discovered accidentally when chest imaging is done for some other reason. With the increased use of CT screening for lung cancer in people at risk, it’s likely that more people will be diagnosed with hamartomas in the future. At the current time, hamartomas are the third most common cause of solitary pulmonary nodules in the lung. If you have recently had CT screening and your doctor is considering that you may have a benign tumor such as a harmartoma, learn about what happens when you have a nodule on screening and the chances that it's cancer. Hamartomas can be difficult to distinguish from cancers but do have some characteristics that set them apart. A description of “popcorn calcification"—meaning images that look like popcorn on a CT scan—is almost diagnostic. Calcification (deposits of calcium that appear white on x-ray studies) are common. Cavitation, a central area of tissue breakdown seen on x-rays, is uncommon. Most of these tumors are less than four cm (two inches) in diameter. Unlike malignant (cancerous) tumors, hamartomas do not usually spread to other regions of the body. That said, depending on their location, they can cause damage by placing pressure on nearby structures. It’s also important to note that people with Cowden’s disease (a syndrome in which people have multiple hamartomas) are more likely to develop cancers, especially of the breast and thyroid. So even though hamartomas are benign, your doctor may want to do a thorough examination and possibly imaging studies to rule out the presence of cancer. Nobody is certain what causes hamartomas, although they are more common in people with some genetic syndromes such as Cowden's disease. Hamartomas often occur as part of the hereditary syndrome known as Cowden’s disease. Cowden’s disease is most often caused by an autosomal dominant genetic mutation, meaning that if either your father or mother inherits the mutation, the chance that you will have it as well is around 50 percent. In addition to multiple hamartomas (related to a form of PTEN gene mutation,) people with this syndrome often develop cancers of the breast, thyroid, and uterus, often beginning in their 30s and 40s. Syndromes such as Cowden's syndrome help explain why your doctor should have a thorough history of any cancers (or other conditions) which run in your family. In syndromes such as these, not all people will have one type of cancer, but a combination of certain types of cancer is likely. The diagnosis of a hamartoma will depend on where it occurs. Since they can appear similar to a malignant tumor (cancer) on imaging, a biopsy is often needed to confirm the diagnosis. Treatment options for a hamartoma will depend largely on the location of the tumor and whether or not it is causing symptoms. If hamartomas are not causing symptoms, your doctor may recommend that the tumor be left alone and observed over time. There has been much discussion over whether hamartomas should be observed or removed surgically. A 2015 review of studies attempted to clarify this issue by weighing the risk of mortality and complications due to surgery with the risk of recurrence of the tumor. The conclusion is that a diagnosis can usually be made by a combination of imaging studies and fine needle biopsy and that surgery should be reserved for people who have symptoms due to their tumor or for people in whom there is still some doubt about the diagnosis. Procedures, when needed for pulmonary hamartomas include wedge resection (removal of the tumor and a wedge-shaped section of tissue surrounding the tumor), lobectomy (removal of one of the lobes of a lung), or pneumonectomy (removal of a lung). Will my hamartoma need to be removed (for example, will it cause any problems if left in place)? What symptoms might I expect if it grows? What type of procedure do you recommend to remove my tumor? Will I need any special follow-up in the future? Is there a possibility that I have a genetic mutation that caused my tumor, and if so, is there any special follow-up I should have, such as more frequent mammograms? Would you recommend genetic counseling? If you are considering genetic testing for a cancer, it is very helpful to have genetic counseling first. You may wish to ask yourself, "What would I do if I found out that I am at risk for cancer?" In addition to hamartomas, there are several other types of benign lung nodules. Hamartomas are benign (non-cancerous) tumors that will not spread to other parts of your body. Sometimes they are left alone, but if they are causing symptoms due to their location, or if the diagnosis is uncertain, surgery to remove the tumor may be recommended. 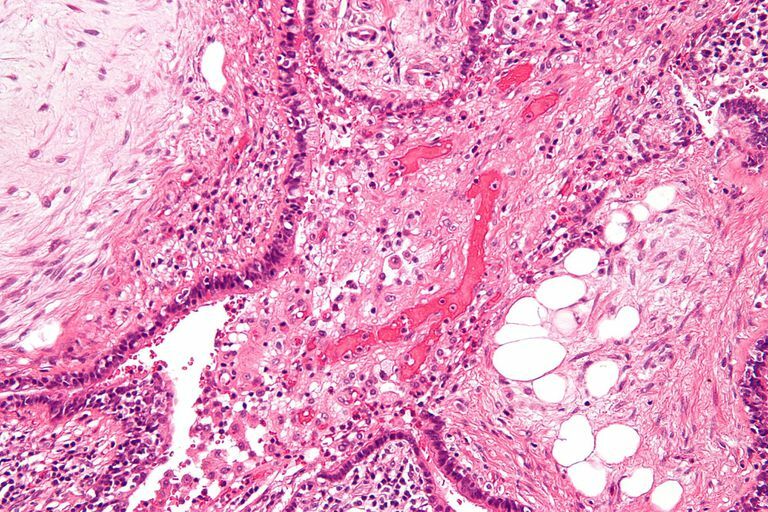 For some people, a hamartoma may be a sign of a gene mutation that can increase the risk of some cancers such as breast cancer and thyroid cancer. It's important to talk to your doctor about any special testing you should have if this is the case. Talking with a genetic counselor may also be recommended. Edey, A., and D. Hansell. Incidentally detected small pulmonary nodules on CT. Clinical Radiology. 2009. 64(9):872-84. Elsayed, H., Abdel Hady, S., and S. Elbastawisy. Is Resection Necessary in Biopsy-Proven Asymptomatic Pulmonary Hamartomas?. Interactive Cardiovascular and Thoracic Surgery. 2015. 21(6):773-6. Farooq, A. et al. Cowden syndrome. Cancer Treatment Reviews. 2010. 36(8):577-83. Saqi, A. et al. Incidence and cytological features of pulmonary hamartomas indeterminate on CT scan. Cytopathology. 2008. 19(3):185-191. U.S. National Library of Medicine. Cowden Syndrome. Published 07/10/18. Mester, J., and C. Eng. PTEN Hamartoma Tumor Syndrome. Handbook of Clinical Neurology. 2015. 129-137.